Definitely not the feel good movie of the year, but a movie that does manage to be enjoyable despite its really tough subject matter. It’s beautiful to look at, has mostly good performances, and looks at a kind of slavery story we don’t always hear much about. I guess the idea of being kidnapped from the north and being brought to the south to be sold into slavery isn’t any more or less cruel than any other pathway to slavery, but it certainly feels that way when you see it played out on screen. I guess the main character, Solomon (Chiwetel Ejiofor), being an educated black man in the north, has a sense that he is removed from the nightmare of slavery. So when he wakes to find himself in chains, it’s not just shocking, but totally unfair. Thus the mood is set for the rest of the film, where we the viewer constantly hope that his real identity will be discovered, and the illegality of his slavery will be revealed because it’s just not fair that HE would be a slave. Which, of course, we realize is true for EVERYBODY who is a slave. Some of what we see, we have seen many times before. 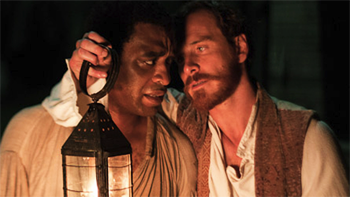 If it’s a movie about slavery, it’s going to have whipping, and cruelty, and the occasional sympathetic white person, but this movie does some of those same things in a way that makes it really hit home just how horrible and bleak it all was. Plus it pulls out a few scenes that were certainly new to me. A few of the accents could have been better, and Brad Pitt’s character (or maybe just his appearance) felt forced, but overall the acting was top notch. And hey, good to see Paul Dano step outside of the box and play a character unlike anything I’ve seen him play! Overall, I guess you could call this a must-see, even if just to remind yourself of how bad things can be, and how crazy it is that people are capable of such horrors. Seriously, this stuff happened. Not that long ago. Ugh. Well, it took me long enough to finally see this. I guess all the hate scared me off, but I really didn’t think it was quite as bad as some were reporting. Disappointing? Sure, but not terrible. Just…a bit too straightforward for this series. Basically it’s just another story of people landing on a strange planet, encountering a life form, and then being turned into monsters by that life form. It reminded me a lot of another movie I reviewed on here not too long ago called The Last Days on Mars, which I guess could just be a ripoff of Prometheus. I like some aspects of this story, mainly the explanation of the black biological substance they encounter and what it was intended for, but other aspects were disappointing. The alien race our human protagonists come to meet turn out to be just as uninteresting as most of the human characters in the movie. Noomi Rapace and Michael Fassbender are pretty good, but the rest of the cast (save for maybe Idris Elba) are fairly dull. And what’s with Guy Pearce being buried in some of the most unconvincing makeup I’ve ever seen? Stryker: There is a war coming, John. McCone: Yes, but a war with who? Emma Frost: Excellent question…though I wouldn’t call it a war, exactly. That suggests that both sides stand an equal chance of winning. Erick Lehnsherr (Fassbender), who will later become known as Magneto, is out for revenge on the man, Sebastian Shaw (Bacon), who killed his mother. Along the way, he crosses paths with another mutant, Charles Xavier (McAvoy). Together they recruit other mutants while Shaw plots to start World War III. Slightly better than the first X-Men, not as good as the second one, and…well, we won’t even mention the third one. There are moments here that are very good, and I definitely liked most of the casting, but at times it just feels overlong. It gets bogged down with too much “mutant and proud” talk. That territory has been covered quite extensively in the other movies, and while it’s certainly relevant to the young mutants here, that doesn’t make it any more fresh. The other thing that didn’t work too well for me was Kevin Bacon as the villain. His presence seemed too gimmicky, which undermined the seriousness of the movie. Now on to the things that I did like. Rose Byrne. If you’ve read my other reviews, you may know of my love for Rose Byrne. This movie did nothing to change that love. She’s awesome. McAvoy and Fassbender are good too, and the younger mutants are played well enough. Michael Ironside even makes an appearance near the end of the movie, which is always a welcome sight. One quick aside about the cast though. In a movie that’s all about promoting the acceptance of everybody no matter what their appearance…there are not a whole lot of minorities present. Plus…I don’t want to be Mr. Spoiler, but…they kill off the black guy first…seriously? And then the other minority character is the first to turn into a villain with very little persuasion needed. Even for something set in the 60s, it’s a very white movie. But hey, there’s some good drama, good action, a few funny moments, and…well, Rose Byrne.